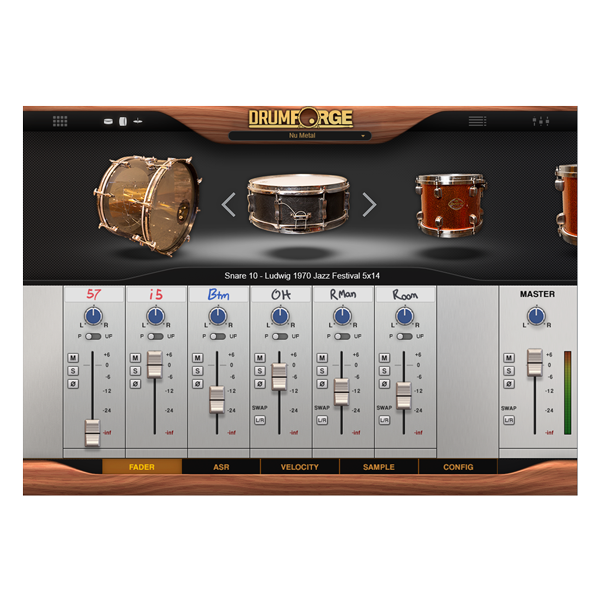 DF-Ultimate Sampler by Drumforge is a Virtual Effect Audio Plugin. It functions as an Audio Units Plugin, a VST 3 Plugin and an AAX Plugin. 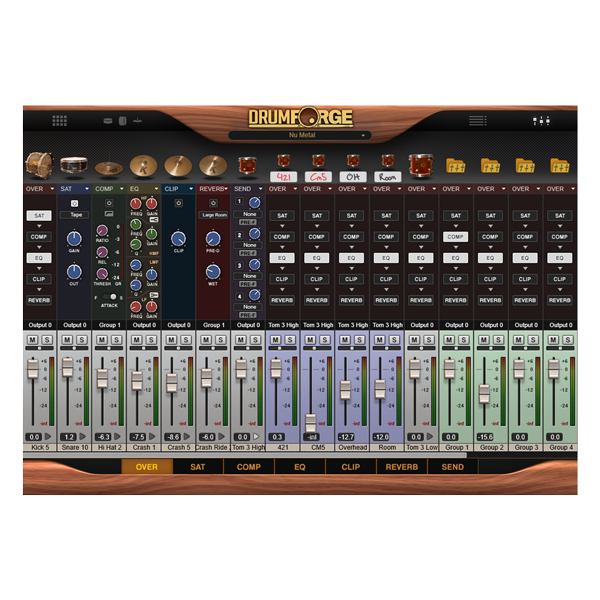 DF-Ultimate Sampler is a drum sampler containing multi-microphone engineering setups designed for both songwriters and engineers. 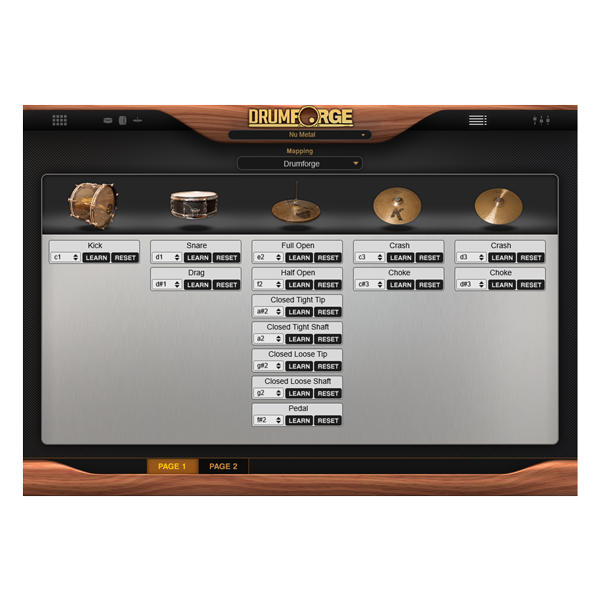 It contains the Drumforge 1 Ultimate sample library with the option to select processed or unprocessed samples. Additionally, it features mix-ready presets and the ability to load and save user created presets. The four main sections of the DF-Ultimate Sampler are the Build, Edit, Map, and Mix pages. Page 1, the Build page, contains the browser that is used to select drums from and build kits. Page 2, the Edit page, contains individual microphone faders, ASR, pitch, sample selection, and MIDI velocity curves for the drum that is selected. Page 3, the Mapping page, allows the user to change the MIDI mapping and select other popular drum sampler maps to convert from. Page 4, the Mix page, contains a channel strip for each drum that is added to the sampler, 8 stereo group channels, and 4 stereo outputs to DAW. Processing modules in the Mix page include a saturation, compression, reverb, and EQ module that can be arranged in any order. The saturation module contains 3 modes which are tube, tape, and distortion. The reverb module contains 9 different modes ranging from small room sounds to large cavernous sounds. Each channel strip also features a send module that allows up to 4 copies of a signal to be sent to a group channel for further processing. DF-Ultimate Sampler is available in 32 and 64-bit VST 3, AAX, and AU formats. Drum sampler for writing, performing, and mixing realistic drums without needing a drummer. Sample engine utilizing disk streaming for fast loading and playback. Drum sample library of 54 drums and 14 cymbals. Change engineering setups and select processed or unprocessed samples per microphone. Signal processing modules designed for mixing drums. Configurable MIDI mapping with presets for help with interpreting maps from other samplers.